As I mentioned earlier, while I love the sweeping vistas Daisetsuzan affords it's the little things that capture my heart the most. 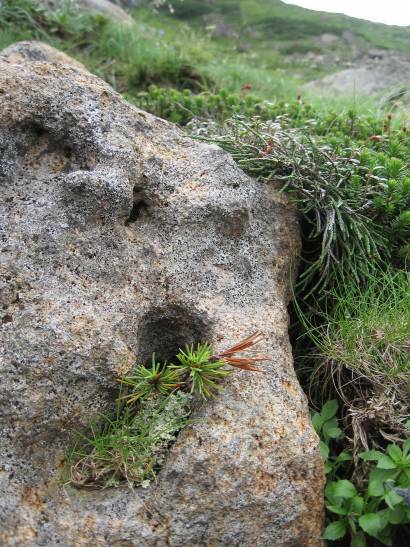 Clustered together in a hole in a rock this moss and tiny evergreen simply made me laugh out loud with joy. Again and again I saw plants growing in what appeared to be the most barren of lunar landscapes or in the tiniest of spaces. They reminded me of the everyday gardens I see here in Tokyo: little spots of life and color where it might be least expected and where it brings the greatest pleasure.